So it turns out that those who noted that the Cyprus bailout took place ahead of a local bank holiday on Monday were onto something. The terms of the bailout deal represent a huge leap in how the EU is tackling the crisis. Time will tell whether this leap is over or into the chasm. This is a quick reaction post. I will focus on likely market reaction because that is what I know about – and why you’re likely reading my ramblings – and leave meditations on justice and democracy to people closer to the action. Deposits below EUR100,000 to suffer 6.75% tax; above 100,000, 9.9%. Four choices have been faced ahead of every bailout; screw the local taxpayer; screw the creditors; the Germans pay for everything; or fiddle the numbers in the hope the crisis just goes away. The Irish programme rested heavily on option 1, the Portuguese and Greek (especially) on options 1 & 4. Hopes for option 3 (ESM buys shares in the banks) are dead in the water. This programme indicates option 2 gaining in strength, 3 & 4 sinking. Taxing local small depositors. This is really shocking, being both the least fair and the riskiest part of this plan. The fairness aspects are obvious, but the risk that other Peripheral depositors will reconsider is clear, albeit so far more popular with the usual suspects than with locals. Cypriot banks have almost nothing in terms of either junior or senior bank claims. Best guess is that the former will take the familiar (Ireland/Spain/Holland) hosing, the latter will be spared. Again, realpolitik – with the exception of Anglo-Irish after it ceased to matter – senior bank bondholders are being protected to save other banks. 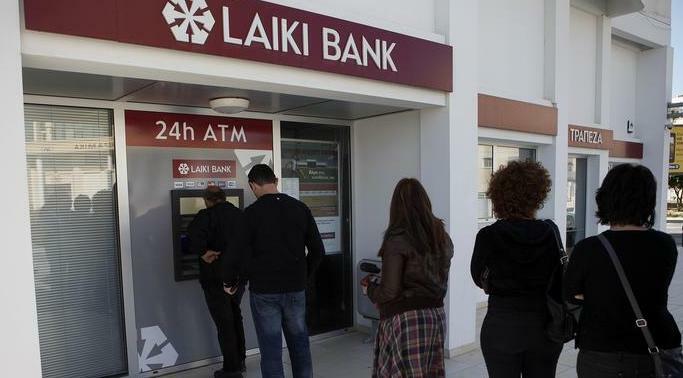 But this means that Cypriot depositors are being sacrificed that depositors in the rest of Europe can be protected. IThe thinking here is pure economics – once-basket-cases like Bank of Ireland recently raised unsecured senior loans, reflecting an important step in European finance’s return to health but the sacrifice of the poorest depositors in one of Western Europe’s smallest and poorer economies is surely the wrong price. The hedge funds win again. A favourite trade for speculators has been Cypriot government debt. And it’s done very nicely. Mayfair sends its thanks. Update: This implies that you’re better off with your money in peripheral government debt than in a bank. That’s a message I personally would be very hesitant to send. My own judgement is that inflicting costs on depositors in principle is an extremely important one, but that not sparing the small depositor is worse than a cruel piece of realpolitik – it is in fact a mistake.